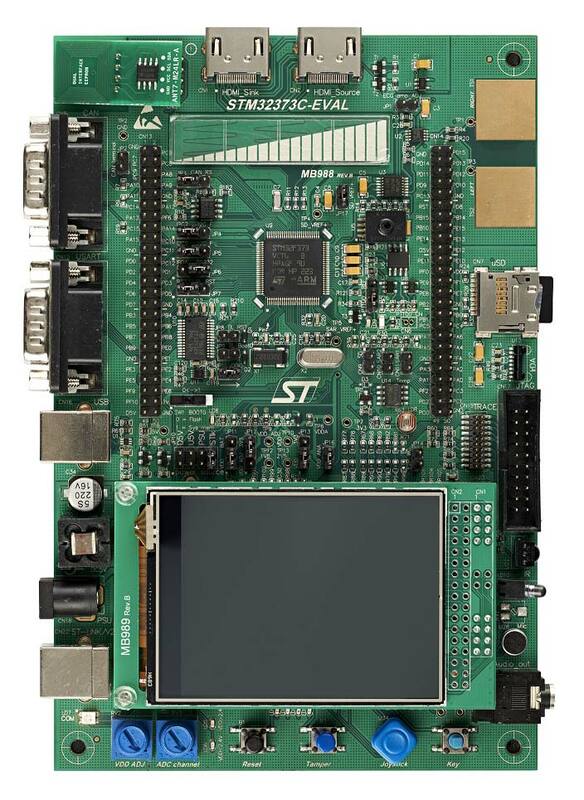 The STM32373C-EVAL evaluation board is designed as a complete demonstration and development platform for STMicroelectronics ARM Cortex-M4 core-based STM32F373VCT6 microcontroller. It features two I2Cs, three SPIs, three USARTs, one CAN, one CEC controller, one 12-bit ADC, three 16-bit sigma delta ADCs, three 12-bit DACs, internal 32-KByte SRAM and 256-KByte Flash, touch sensing slider, USB FS, and JTAG debugging support. This evaluation board can be used as a reference design for user application development but it is not considered as the final application. The full range of hardware features on the board can help the user evaluate all peripherals (USB FS, USART, audio DAC, microphone ADC, dot-matrix LCD, IrDA, LDR, MicroSD card, HDMI CEC, ECG, pressure sensor, CAN, IR transmitter and receiver, EEPROM, touch slider, temperature sensor, etc.) and develop their own applications. Extension headers make it possible to easily connect a daughter board or wrapping board for a specific application. An ST-LINK/V2 is integrated on the board as an embedded in-circuit debugger and programmer for the STM32 MCU. The STM32373C-EVAL evaluation board does not support STM32F3x8 MCUs (1.65 V to 1.95 V power supply).